Command both respect and style on the LARP battlefield with the Celtic Isolde Leather Bodice. 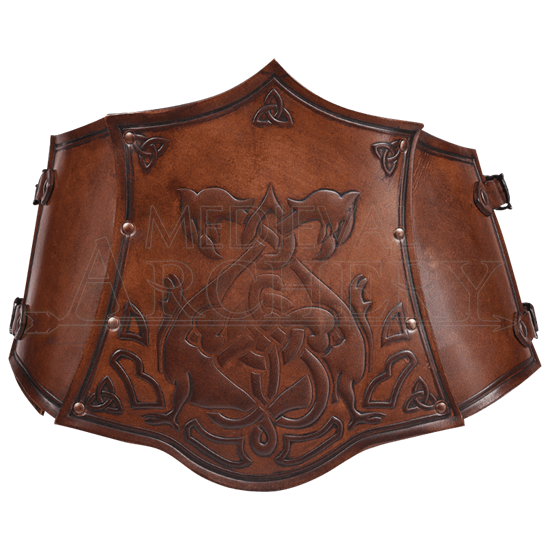 This gorgeous piece of armour not only accentuates your waist, but also raises your defense during light combat and training. The corset is fashioned from six riveted segments of high-quality leather. An antique patina finish and embossed imagery lend it a beautiful, distinctive air. A pair of griffons with Celtic vinery decorates the front segment, while more Celtic knots accent the back. Two adjustable buckle straps adjust the fit at each side.